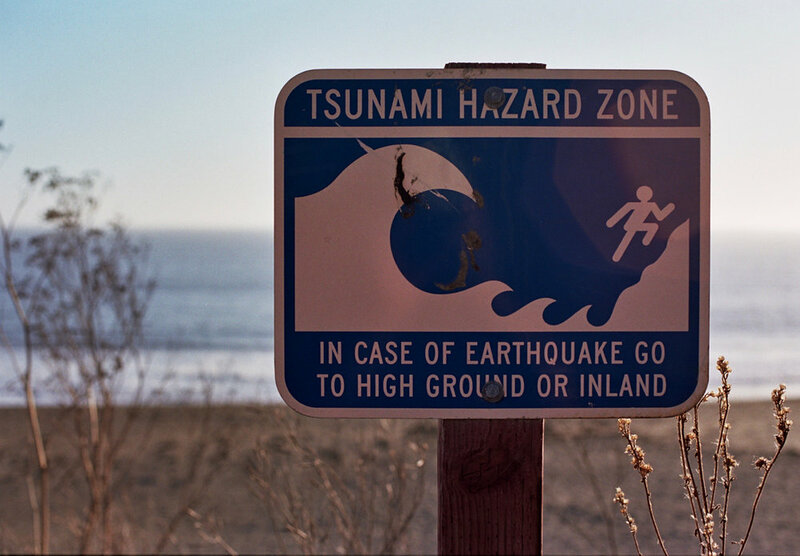 In the wee hours of Tuesday morning, a nearly 8.0 earthquake off the coast of Alaska triggered tsunami warnings up and down the entire west coast of the US. The Sonoma County Sheriff's office pinged my phone and of course, I slept right through the whole thing...including the cancellation of the warnings. I'm far enough away from and several hundred feet above the water, so even if the big wave did hit, our little community wouldn't have noticed much. It did get me thinking about those signs I always see when I'm hiking down to the sand. I've photographed them many times. Here are two shots. For me, these signs have always just been interesting photo subjects. Until this week, I really never paid much attention to the real message or even thought about the likelihood of the actual event they were warning me about. It made me think about another sign from my youth that I saw attached to my school and all sorts of public buildings; the fallout shelter sign. This was the 1960s and the Cold War was in full swing. We had air raid drills as often as fire drills. During an air raid drill, the teacher would have us move away from windows and crawl under our desks. Even as a child, I wondered about how hiding under my rickety wooden school desk was going to protect me from a nuclear bomb. We had a fallout shelter in our school as well. It was in the basement. You would think that during at least one of these drills, they'd have us practice going down there, but they never did. I wonder if during the real thing, only the administrators would go down to the fallout shelter leaving us kids up top clinging to our desks? Luckily, the real thing never came...back then and while I slept peacefully Tuesdsay morning.